Awesome Treat Alert: Stella & Chewy’s!!!!!!!! Just to start this off – Stella & Chewy’s are so crazy, ridiculously good that my friends and I call it ‘doggie crack’. To be clear I have not personally tried Stella & Chewy’s. Not just because they are for dogs (there was that late-night Milkbone incident), but because they are a raw food. However, the trembles that go through my dog’s body and the creepy way she stares at me when I say “You want a Stella & Chewy’s?” is all the proof I need that these treats are perhaps the best treats on the planet. * Organic fruits and vegetables including cranberries, carrots, apples, spinach, broccoli and beets. Then on top of that, she actually took them from the person at the store! The words “Stella & Chewy’s” bring the same level of doggie joy and excitement as “Car ride”. That says A LOT. 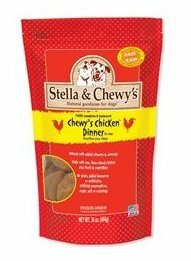 So quick rundown: Stella & Chewy’s can be a bit tricky to find in the store. You need to check pet stores that carry a lot of natural and organic brands. Here in Seattle I know that Fido-n-Scratch (Leschi & Madrona), Immortal Dog (Central District), and Happy Endings Urban Mercantile (Capitol Hill) carry these treats. If you have trouble finding them near you, check out Stella & Chewy’s website: www.stellaandchewys.com. You can either get the actual treats (Carnivore Crunch and Carnivor Kisses) or the Freeze Dried Dinners which come in Chicken, Beef, Duck, Lamb, and Surf & Turf. I prefer to get the dinners and break them up into treat sizes. I strongly recommend you give these a try – you (and your dog) will be very happy you did! Posted in Dogs, food, reviews, treats. Bookmark the permalink. I am glad you found something that works for you. We sometimes bring these patties with us when we go camping because they are nice and light. There are a few pet stores on the North end that carry them. I have never been to either of these pet stores. As a blogger and dog lover I like to check out new stores and write about them if they are way cool. I am hopefully going to Fido-n-Scratch tomorrow for that pet nutrition talk. I will look into the other one.